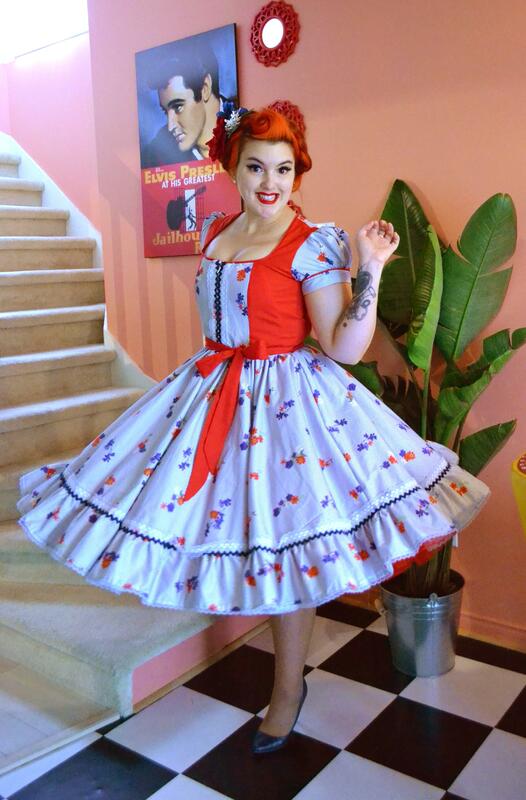 I always been obsessed by Dirndl dresses and find them so feminine and pretty! I don’t know if it is just me, but there is kind of a vintage look to them, which I love. 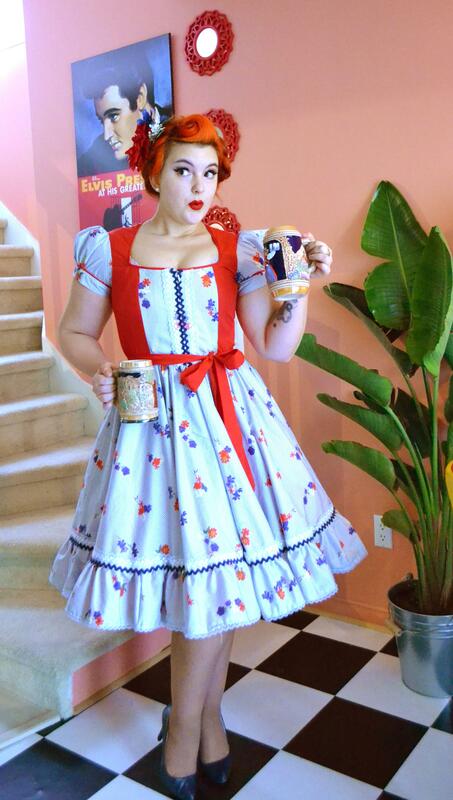 That is why, I was so thrilled when Gertie Released a Dirndl dress inspired pattern, the Butterick B6352. What I love the most about this design, is that it does not have the ‘’traditional Costume’’ look, in fact you can easily rock this look every day. 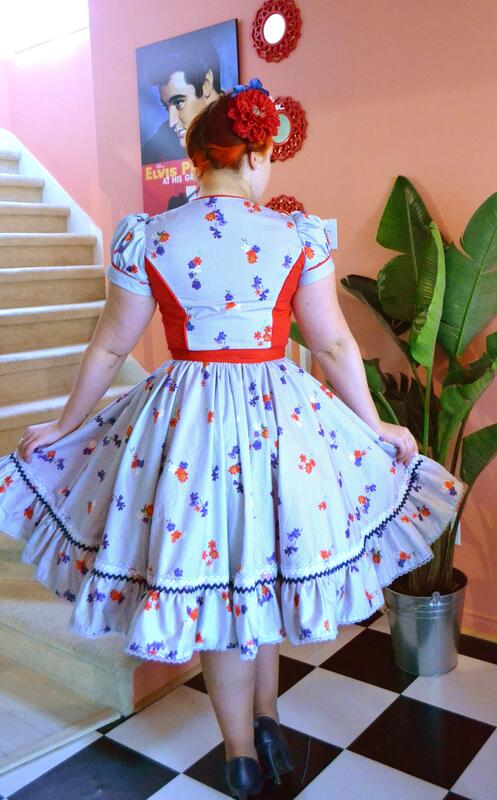 The dress has puff sleeves that resemble a dirndl blouse, a low-cut square neckline, princess seams, a front zipper, a gathered circle skirt with a hemline ruffle, and a waist sash, exactly like on the traditional dirndl apron. 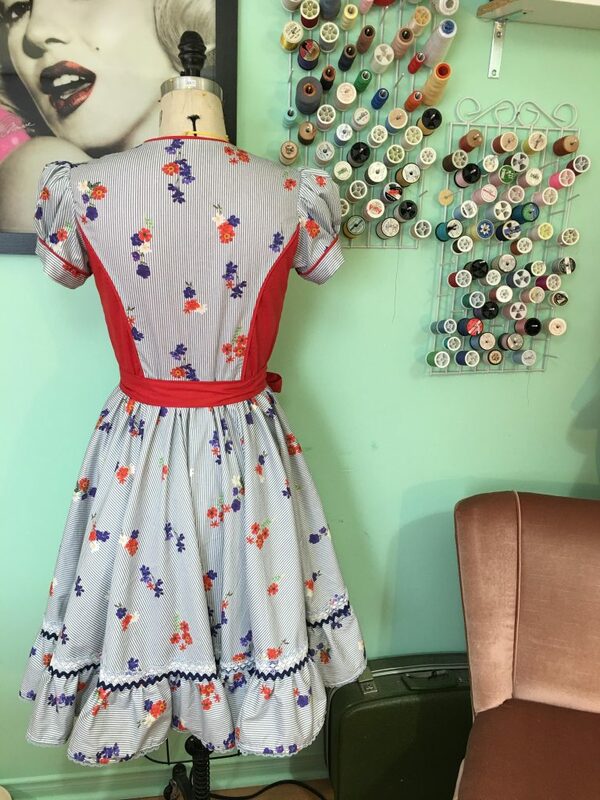 To make it even more vintage inspired, I chose a very pretty stripped poplin with delicate violet and red flowers, from Fabricville’s spring collection. Mymy, there was a lot of beautiful fabric to choose from, this season collection is definitely on trend with a lot of floral prints and bold colors. Now, time to draft the pattern to my own size. 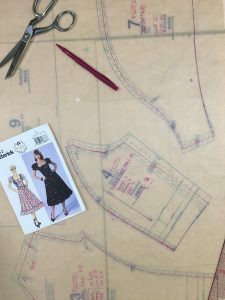 Since I am used to sew with Butterick patterns, I always trace my size on pattern paper, so I can alter directly on the pattern pieces. 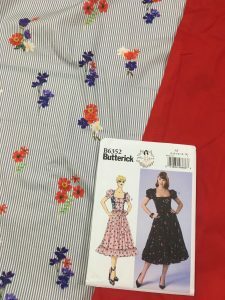 I am always in between size 10 and 12, but I end up tracing size 10 since Butterick patterns have a lot of ease in them, I prefer my dresses more form fitting. 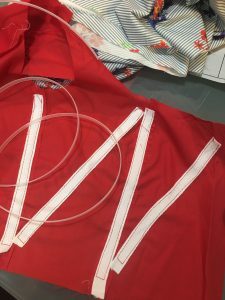 I am making view B with piping and contrasting red side panels on the bodice, I am using a red cotton poplin, I just love this poplin’s quality, it is my go to fabric for lining. ( I hate silky lining!) The contrast gives an interesting look to the dress bodice, it gives the illusion that it is a traditional dirndl dress. It is my first time sewing with piping so, please bear with me! Wowww!! It went better than expected, look at this flawless piped seam! 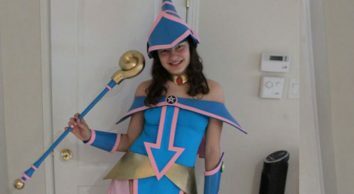 I don’t know why I waited this long before sewing with piping! I love how professional the princess seam looks! Since dirndl bodices are so fitted, so using boning was a must! 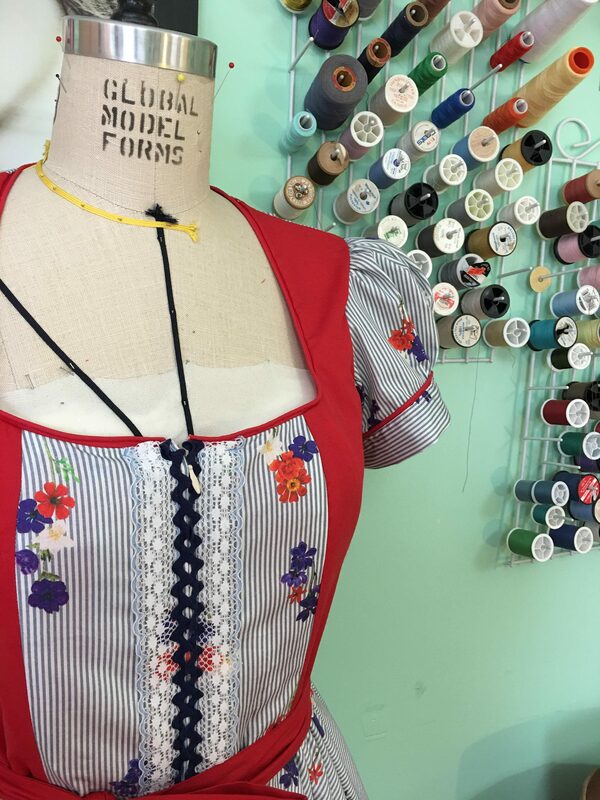 The pattern calls for only 2 rows of boning on each side of the front zipper opening (like most of the traditional dirndl). But, I wanted to have more support, I have added some on the side and the front princess seams. 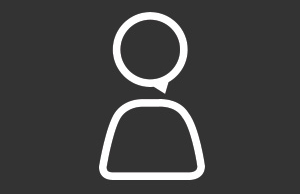 I choose to place my boning channels like so. 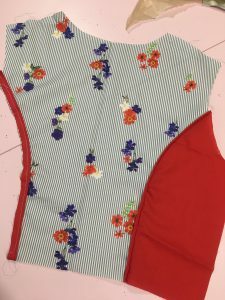 This will give support to the bodice and a really form fitting and smooth silhouette! That’s what I love most with vintage-inspired fashion, how well-defined is the waist, it is so feminine! 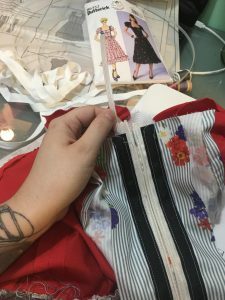 I am obsessed with Rick-Rack and lace trims… I sew them everywhere and almost all of my me-made dresses have some! This one was calling for giant Rick-Rack and lace! It gives a nice finish to the skirt and accentuate the ruffled hem. 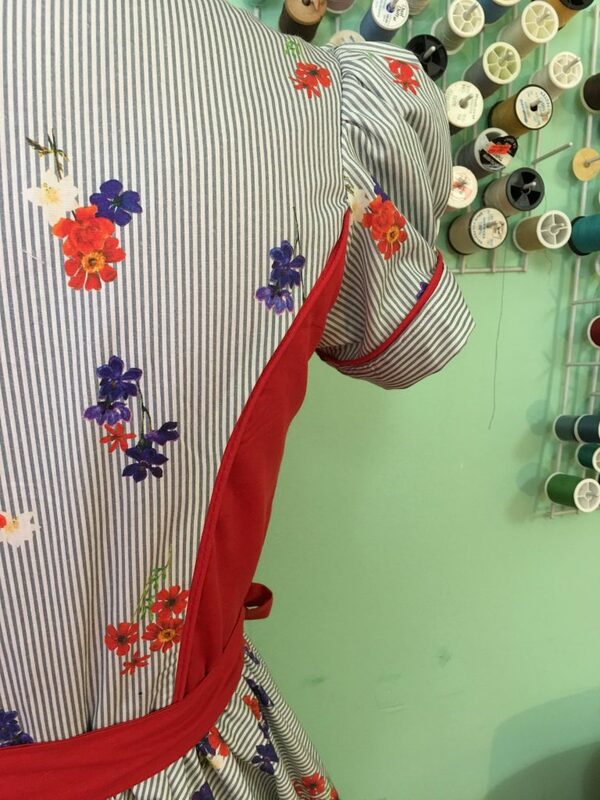 It is usually the last step of making a dress, and it is the one I enjoy the most doing! Voilà! 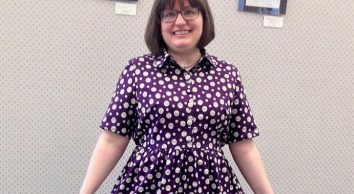 The dress is finished! Have you already made this pattern, what are your thoughts? Is it a style that you would wear? I am curious to know! 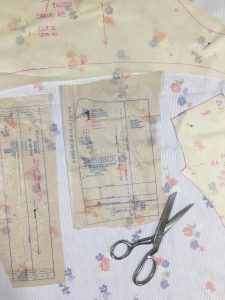 Happy Sewing, until next time! I love this fabric!! I can’t find it on their website, is it not available yet? Thank you! 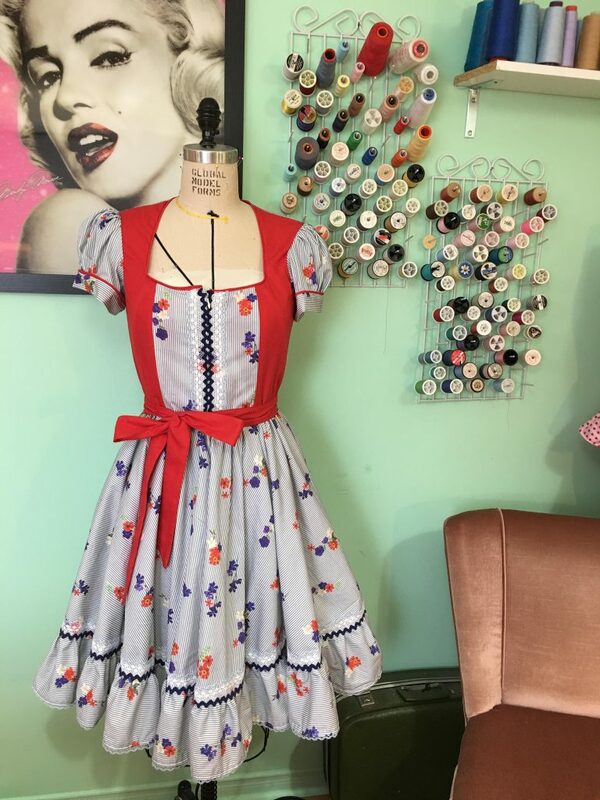 Here is a link to a similar fabric. It may be sold out online but if you are interested we can look for it at one of the stores. On veut plus de blog de Melyna!